Comes out of hibernation tomorrow 12/6/2014. Closest approach to Pluto will be on July 14. NASA’s New Horizons spacecraft comes out of hibernation for the last time on Dec. 6. Between now and then, while the Pluto-bound probe enjoys three more weeks of electronic slumber, work on Earth is well under way to prepare the spacecraft for a six-month encounter with the dwarf planet that begins in January. Since launching in January 2006, New Horizons has spent 1,873 days in hibernation – about two-thirds of its flight time – spread over 18 separate hibernation periods from mid-2007 to late 2014 that ranged from 36 days to 202 days long. In hibernation mode much of the spacecraft is unpowered; the onboard flight computer monitors system health and broadcasts a weekly beacon-status tone back to Earth. On average, operators woke New Horizons just over twice each year to check out critical systems, calibrate instruments, gather science data, rehearse Pluto-encounter activities and perform course corrections when necessary. New Horizons pioneered routine cruise-flight hibernation for NASA. Not only has hibernation reduced wear and tear on the spacecraft’s electronics, it lowered operations costs and freed up NASA Deep Space Network tracking and communication resources for other missions. 'Video' of Charon orbiting Pluto from July 2014. I'm looking forward to seeing how things have progressed. Made of Stars wrote: 'Video' of Charon orbiting Pluto from July 2014. I'm looking forward to seeing how things have progressed. Cool! This is going to be great! Can't wait for this. To see close-up pictures of Pluto and Charon for the first time will be amazing. Fingers crossed! We are not compelled to believe in biological uniformity in order to affirm human freedom and dignity. From 2.9 billion miles away, NASA's New Horizons spacecraft let its handlers know on Saturday that it has awakened from hibernation and is ready for the climax of its nine-year trip to Pluto. The first signals were received at the mission's control center at Johns Hopkins University's Applied Physics Laboratory in Maryland via a giant radio antenna in Australia just before 9:30 p.m. ET, nearly four and a half hours after it was sent by the piano-sized probe. It takes that long for signals to travel between there and here at the speed of light. Later readings confirmed that New Horizons was fully awake. We certainly are living in exciting times. Damn straight. I cannot think of any time in history as exciting as today. We were just talking about this the other night, my grandfather was born in 1894 (or '92, I can't remember), and died in 1971. He remembered, as a child, seeing the newspaper accounts of the Wright brother's first powered flight. He remembered Lindbergh's flight and saw the moon landing. Bloody amazing. The dramatic changes in technology that our grandparents witnessed may never be equaled but I was thinking that I may be one of those people who, when we do land a man or mars, will be saying "when I was 9 I remember the first man landing on the moon". I hope I make it. Very exciting times we live in! You youngsters with your high-falutin replicators and warp drives! Why, in my day, we had airplanes with pistons and propellers! Didn't need no anti-matter, just some good 'ol crude oil and a spark plug. At the moment of closest approach, it would take 4 hours 25 minutes for signals to get from Pluto to Earth. However, New Horizons will not be in contact with Earth at that time; it will be pointed at Pluto system targets, feverishly gathering highest-priority science. The first moment that we on Earth will hear from New Horizons after closest approach is not until July 14 at 18:09 PDT / 21:09 EDT / July 15 at 01:09 UTC! That moment is called the "Phone Home" and will essentially be a "beep" indicating that the spacecraft is healthy and still running its science program. The first data from the close approach phase -- including single-frame, black-and-white photos of Pluto, Charon, and Hydra -- will not be received for another 10 hours, on Wednesday, July 15 at about 04:00 PDT / 07:00 EDT / 11:00 UTC on Earth. MacIver wrote: We certainly are living in exciting times. Hubble Space Telescope data suggests that 2014 MU69, a small Kuiper Belt object (KBO) about a billion miles (1.6 billion kilometers) beyond Pluto, is as red, if not redder, than Pluto. 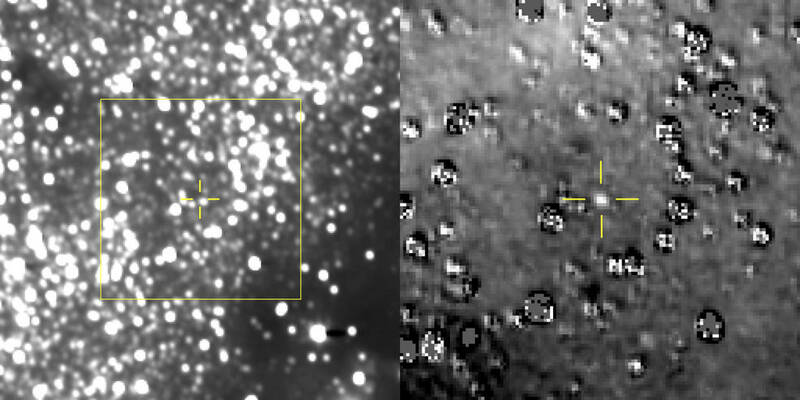 This is the first hint at the surface properties of the far-flung object that New Horizons will survey on Jan. 1, 2019. Pluto may harbour a slushy water ocean beneath its most prominent surface feature, known as the "heart". This could explain why part of the heart-shaped region - called Sputnik Planitia - is locked in alignment with Pluto's largest moon Charon. A viscous ocean beneath the icy crust could have acted as a heavy, irregular mass that rolled Pluto over, so that Sputnik Planitia was facing the moon. The findings are based on data from Nasa's New Horizons spacecraft. The space probe flew by the dwarf planet in July 2015 and is now headed into the Kuiper Belt, an icy region of the Solar System beyond Neptune's orbit. Sputnik Planitia is a circular region in the heart's left "ventricle" and is aligned almost exactly opposite Charon. In addition, Pluto and Charon are tidally locked, which results in Pluto and Charon always showing the same face to each other. Tonight is the first chance (there's 2 more) to watch as 2014 MU69 occults a distant star. This object is the next fly-by target for the New Horizons probe and is roughly 1 billion miles further out in the Kuiper belt of the solar system. The 2-ish second duration event will be monitored from remote stations in South America and South Africa. The team hopes to gather further information on the size and shape of MU69 and any possible ring/debris material nearby to help plan the fly-by. 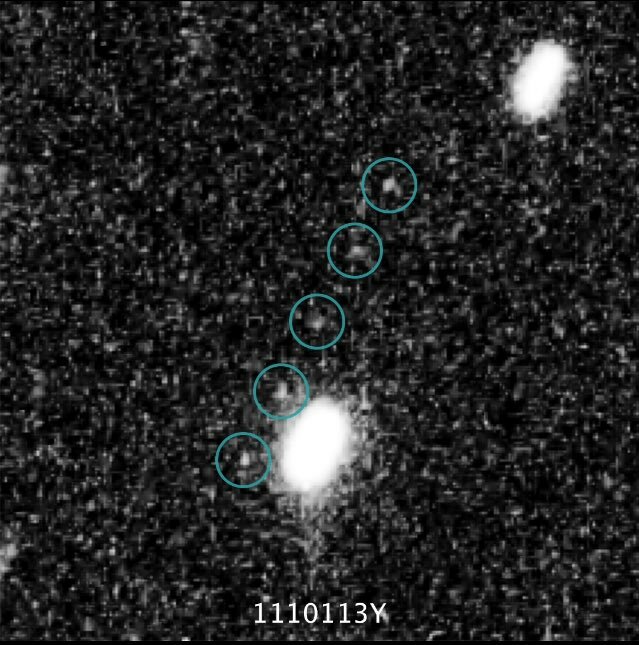 NASA's New Horizons spacecraft has made its first detection of its next flyby target, the Kuiper Belt object nicknamed Ultima Thule, more than four months ahead of its New Year's 2019 close encounter. Griz_ wrote: The dramatic changes in technology that our grandparents witnessed may never be equaled but I was thinking that I may be one of those people who, when we do land a man or mars, will be saying "when I was 9 I remember the first man landing on the moon". I hope I make it. Very exciting times we live in! We went from the first manned flight to the moon in 65 years. A Mars landing should have started planning in 1970 or earlier once the moon was reached. Instead we decided to sink a tonne of dough in a reusable orbiter. We need to show more ambition.